Summon: If the top card of your deck is an action, draw it. Otherwise, put it on the bottom. Abecean Navigator is a common Intelligence creature card. It is part of the Core Set. 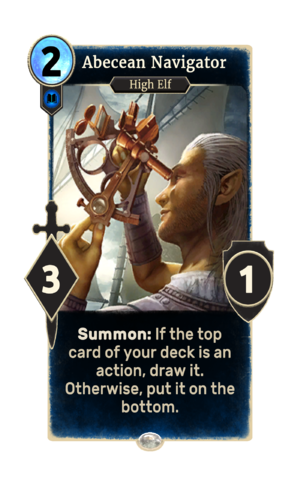 In addition to the card's availability in the Core Set, two copies are included in the Telvanni Ambition theme deck. The card is named for the Abecean Sea.